Home › Chicago Vol. 5, Shirt 6: "Thunder Bears"
Chicago Vol. 5, Shirt 6: "Thunder Bears"
Available EXCLUSIVELY ONLINE through March 17th, then it's gone! $8 from every sale will be donated to the family of Levi Coulter. This work of parody is not affiliated with, endorsed, or sponsored by Rankin-Bass Animated Entertainment or the Chicago Bears. Levi Coulter was born with an undiagnosed condition and was not going to let that change a thing. He worked so hard daily along side his mother and father, showing them what true love, dedication and strength truly was. Levi fought so hard daily, however his little two and a half year old body couldn't take it anymore and sadly he left this earth on Monday 1/14/19. 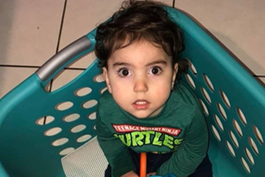 His parents, Sarah and Matt, dedicated their lives to ensuring Levi had everything he needed, therapies, G-Tube Feeds, appointments, trips to specialists and so much more. Sarah stayed home with Levi, leaving her job at a local hospital, to assist in his day-to-day needs. She and Matt will soon face stacking bills and the hardships that follow laying a child to rest. We want to help. Please consider a shirt purchase or donation to their online fundraiser.